HSAC wishes to thank Mr Jeno E. Horvath of Vancouver for his continued support of this series and his help in having this issue printed and prepared for digital publication here. 1. J.E. Horvath: Hungary through Western Eyes, 1991. 2. Judith Galántha-Hermann: A Political Background Study of Alexander Csoma de Kõrös’s Time in Ladakh, 1992. 3. Judith Galántha-Hermann: Unfinished Past: A Different View on Certain Aspects of the Life and Times of Alexander Csoma de Kõrös in Ladakh,1993. 4. Kovácsné Papp Ildikó: Szabó T. Attila, a nyelvmûvelõ nyelvtörténész, 1993. 6. Barnabas Racz: The Hungarian Left-Opposition in the Pre-Election Campaign in 1993, 1994. 7. Kalman Dreisziger: Hungarian Community Folkdance Groups in Canada, 1994. 8. Judith Galántha-Hermann: Alexander Csoma de Kõrös and the Evolution of the Traditional Tibetian Medicine, 1994. 9. Joseph Pungur: The Churches in Communist Hungary 1948-1990, 1994. 10. Fiore Mester: Péter Pázmány’s Personality in the Light of Old and Modern Typologies, 1994. 12. J.E. Horvath: Kossuth Memorabilia in North America, 1995. 13. J.E. Horvath and Dr. Éva S. Cserey: Important Stove Tiles at the Museum of Anthropology in Vancouver, British Columbia, 1995. 14. Barnabas Racz: Beyond the 1994 Hungarian Socialist-Liberal Coalition, 1995. 15. Judith Galántha-Hermann: The Interrupted Journay: Myth and Realities about Tibet and Alexander Csoma de Kõrös, 1996. 16. László Szabó: Four Papers in Comparative Linguistics, 1997. 17. Kissné Novák Éva: A nõi szerepek változása, 1997. 18. Judith Galántha-Hermann: A Closer Look at the Lifestyle and Health of Alexander Csoma de Kõrös through the Eyes of Traditional Tibetian Medicine, 1997. 19. László Szabó: More Papers in Comparative Linguistics, 1997. 20. Telchné Dancs Rózsa: Grafika, kisplasztika, ex libris, 1998. 21. Judith Galántha-Hermann: The Ways of Living – The Ways of Learning:A Short Comparative Study of Ladakh and Transsylvania, 1998. 22. László Szabó: Maliseet and Hungarian, 1998. 23. Három tanulmány. Szerzõk: Kovácsné Papp Ildikó, Kuún Géza, Sömjénné Csécsy Magda, 1999. 25. Maria H. Krisztinkovich: Palissy, 1999. 26. Fiore Mester: Endre Ady, Poet of Preverbal Experiences, 2000. 27. Judith Galántha-Hermann: Up close: Sangye Phuntsog, the Ladakhi teatcher of Alexander Csoma de Kõrös, 2000. 28. J.E. Horvath: A Glimpse Into Hungarian Cultural History. 2001. 29. Kissné Novák Éva és Rácz Barnabás:Nemzettudat és kollektív emlékezet Magyarországon és az Egyesült Államokban, 2001. 31. Judith Galántha-Hermann: Facts or Fiction? A Comparative Study of Food and Dietary Habits Pertaining to Alexander Csoma de Kõrös, 2001. 32. Miska János: Jelenlétünk Kanadában, 2001. 33. Maria H. Krisztinkovich: Báró Koppay József festõmûvész újra-felfedezése, 2001. 34. Judith Galántha-Hermann: Buddhist Spirituality in the Life of Alexander Csoma de Kõrös, 2002. 36. Rácz Barnabás: A Kúria és a magyar öröklési jog a 20. században, 2003. 37. Judith Galántha-Hermann: Behind the Masquerade, Beneath the Mask: A Comparative Study of the Use of Masks in Hungary, Tibet and Bali, 2003. 38. Maria H. Krisztinkovich: Szerelmem Emelkám, 2003. 39. Bisztray György: Három kellemetlen tanulmány/Three Unpleasant Papers, 2003. 40. 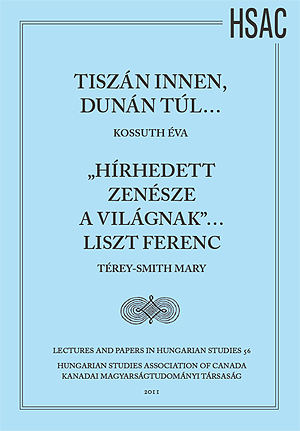 Maria H. Krisztinkovich: Primary Sources Relating to The Anabaptists in Hungary, 2003. 41. Maria H. Krisztinkovich: Bonne Espérance, Labrador, and the Hutterites: Further Notes on a Sixteenth Century Migration Plan, 2003. 43. Judith Galántha-Hermann: The Last Rites: Facts and Peculiarities, 2004. 44. Judith Galántha-Hermann: New Discoveries About Alexander Csoma de Kõrös and the Buddhist Monasteries of Northern India, 2004. 45. Kissné Novák Éva: Két tanulmány, 2005. 46. Judith Galántha-Hermann: Started by a Revolution, Ceased to Exist by Another: A Brief History of the Hungarian Voice of Radio Canada International, 1956-1991, 2006. 47.Two Papers by George Bisztray and Eva M. Tomory, 2008. 48. Kossuth Éva: A magyar nyelv használata Faludy György költészetében, 2008. 49. Térey-Smith Mary: Az Esterházy hercegi család zenekara a XVIII. században, 2008. 50. Bogyó-Homor Anna Mária: Megemlékezés Kodály Zoltánról, 2008. 51. Eva M. Tomory: Hungarian-born Entrepreneurs in Canada, 2009. 52. Bencsics Klára: A ninivei próféta: Babits Mihály. 53. Éva Kossuth: The Multicultural Activities of Hungarian Violinist Géza de Kresz, 2009. 54. Térey-Smith Mary: Gróf Erdõdy János pozsonyi operatársulata 1785-89, 2009. 55. Lisa Turkewitsch: The Europeanisation of Hungarian Foreign Policy, 2009. 56. Kossuth Éva: Tiszán Innen, Dunán Túl… és/and Térey-Smith Mary: „Hírhedett zenésze a világnak”… Liszt Ferenc, 2011.